What’s for dinner? If you subscribe to one of these popular cooking subscription boxes, your typical dinners, lunches, and even breakfasts and snacks will be replaced with wholesome restaurant-quality meals that you can make right at home. Not only do these boxes make cooking for your family easy and delicious—they’re also great for helping inexperienced chefs learn to cook, giving busy families more time to connect, or just getting your out the door faster every morning. The Cost: Subscriptions cost between $8.74-$9.99 per serving depending on your plan, plus shipping. Sign up here! What kind of food do you get? : Hello Fresh serves up classic, crowd-pleasing flavors, plus a few fun twists to help expand your palette! We love that their ingredients come bundled by recipe, so that you can easily take them from the fridge to the countertop and get started. We think the approachable, yet interesting recipes would be great for families! Check out our Hello Fresh reviews to learn more! The Cost: Subscriptions cost between $7.49-$9.99 per serving, depending on your plan, plus shipping. Sign up here! COUPON: For a limited time, save $60 of your first three months of Blue Apron ($20 per box) with this link! What kind of food do you get? : Blue Apron meals put flavorful twists on classic fare, sort of like what you might expect from a hip neighborhood bistro. Each week, you’ll get pre-portioned ingredients for balanced, seasonal recipes that cook up quickly and reflect a myriad of global flavors. The company takes sustainability seriously and aims to use responsibly farmed meats and produce as often as possible. Blue Apron has also done fun, limited-edition menus with programs like Whole30, Weight Watchers, Chrissy Teigen and Bob’s Burgers. Check out our Blue Apron reviews to learn more! The Cost: Meals start at $9.95 per serving, and delivery is free for orders over $45. Sign up here! What kind of food do you get? : Home Chef recipes are always yummy and family friendly. The flavors are familiar, yet fun, plus the portions are always filling. Home Chef also offers add-ons like fruit, snacks, no-cook lunches and smoothies! Check out our Home Chef reviews to learn more! The Cost: Recipes begin at $12.00 per plate. Get free shipping with 3+ recipes per week plans. Sign up here! What kind of food do you get? : Plated meals put a trendy, hip spin on popular flavors. Their ingredients include antibiotic-free meats, seasonal produce, and other quality ingredients. Everything is bundled by recipe for your convenience, too! They also offer incredible desserts for just $4 per serving (available after your first order). Check out our Plated reviews to learn more! The Cost: Most plans are $11.99 per meal + shipping ($6.99 shipping fee per order). Sign up here! COUPON: Get $35 off your first box when you use this link! What kind of food do you get? : Sun Basket was created by Chef Justine Kelly of San Francisco’s famed Slanted Door restaurant. The recipes in the subscription reflect her passion for sustainable eating. The dishes are wholesome, fresh, and deliciously uncomplicated. Their simple recipes feature organic vegetables, antibiotic and hormone free meats, and sustainable seafood, all of which comes pre-portioned and ready to prepare! Check out our Sun Basket reviews to learn more! Which special diets do they cater to? : Gluten-Free, Paleo, Lean and Clean, Vegetarian, Mediterranean, Vegan, Pescatarian, and Diabetes Friendly. Ships to: Currently shipping to most zip codes in the United States, excluding AK, HI, MT, and parts of NM. The Cost: $12.00 per serving. Sign up here! What kind of food do you get? : Vegans, this one’s for you! Purple Carrot offers three new completely vegan meals per week. They’re dairy and meat-free, but each recipe is overflowing with flavor. Vegan eaters love the yummy dishes in this box, which range from familiar to just adventurous enough. Curious about going vegan? This box might be the place to start! Check out our DegustaBox reviews to learn more! The Cost: Ranges from $49.99 for 4 meals per week to $197.989 for 12 meals per week, with free shipping. Sign up here! COUPON: Get 30% off your first order when you use this link! What kind of food do you get? : Not a fan of cooking? Freshly’s meals arrive fresh and ready to eat in 3 minutes or less! The chef-curated dishes, which include entrees and breakfasts, are simple, healthy, and clean—they’re gluten-free, protein-packed, free from refined sugars, and all natural. Check out our Freshly reviews to learn more! Ships to: Most of the contiguous US (they’ve been working on expanding their delivery area in 2019!). Check here to make sure they deliver to you. The Cost: $11.49-$12.99 per meal, depending on your preferences. Sign up here! NEW DEAL: Save $40 off your first order by using this link! What kind of food do you get? : Green Chef connects you with fresh, sustainable, organic ingredients and delicious, healthy recipes. Their menus include everything from fresh twists on classic comfort foods to globally inspired cuisine. Plus, everything you get is GMO free, USDA certified organic, sustainable and traceable, and best of all, designed with amateur cooks in mind. Even if you’re new to the kitchen, you’ll be able to make these flavorful dishes! Check out our Green Chef reviews to learn more! The Cost: $11.99 per serving + $6.99 shipping. Sign up here! COUPON: Get 6 meals for $36 when you follow this link! What kind of food do you get? : Gobble’s 15-minute dinners help you get from the kitchen to the dinner table fast. They do much of the portioning, chopping, and marinating for you, so cooking is as simple and easy as can be. Their meals come with a healthy balance of flavors and fresh ingredients, helping you create classic, familiar flavors for you and your family. Check out our Gobble reviews to learn more! The Cost: $69.99 – $99.00 depending on your subscription level + free ground shipping. Sign up here! COUPON: Get $10 off your first order when you use this link! What kind of food do you get? : Vegans will love this ultra-simple plant-based recipe subscription box. Choose the meals you’d like and you’ll receive the pre-prepped ingredients in grocery-style packages. Each recipe takes just a handful of ingredients and a few minutes to prepare. They also have pre-made sweets and snacks worth checking out! 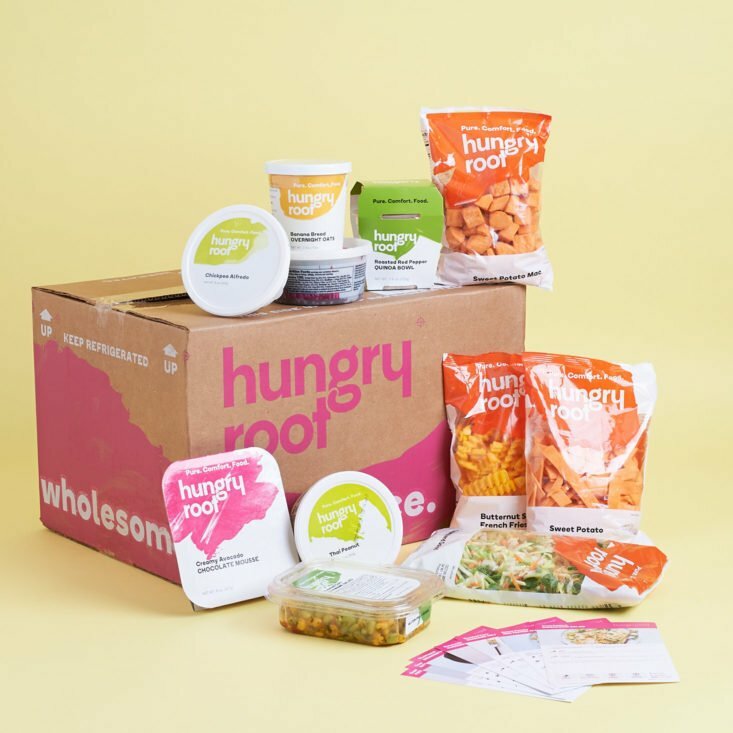 Check out our Hungryroot reviews to learn more! Which special diets do they cater to? : Vegetarian, vegan, gluten-free, low-sugar, low-calorie. The Cost: $45 a box (plus $6 shipping per box) or $44 a box when you choose a 3-month subscription. You may also purchase a one-time gift box for $49 a box (plus $6 shipping). Sign up here! What kind of food do you get? : Unlike some other meal kits on this list, CrateChef sends you a selection of a celebrity chef’s favorite kitchen goodies that you can use across a myriad of recipes. Think cookbooks, tools, and pantry items. If you’re a more experienced cook who likes to design their own recipes, then you’ll love the inspiration in this box! Check out our CrateChef reviews to learn more! Which special diets do they cater to? : None. Example products: High-quality ice cream scoopers, alphabet cookie cutters, organic tahini, cookbooks like Whitney Miller’s New Southern Table and Knife: Texas Steakhouse Meals at Home, artisan jerky and sausage, specialty salts, and more. The Cost: Meals start at $8.20 per serving + free shipping. Sign up here! COUPON: Get $15 off your first box when you follow this link! What kind of food do you get? : Marley Spoon sends you the quality, artisanal ingredients and recipes to make some of Martha Stewart’s favorite dishes. Choose your favorites from a wide variety of classic and creative recipes, then schedule and receive your box at your convenience. Check out our Martha & Marley Spoon reviews to learn more! The Cost: $129 a month + free shipping. You can also save $20 by doubling any order, or pay $149 to choose all your own meats. Sign up here! COUPON: Get free ribeye steaks + $10 off with your first box by using this link! What kind of food do you get? : Butcher Box is a subscription just for the meat lovers out there! Each box contains 8-11 pounds of grass-fed beef, heritage pork, and free-range organic chicken, depending on the preferences you set. They also offer a pick-your-own box where you can subscribe to any combination of steaks, bacon, and ground meats that you like. These exceptional, nutritionally rich products are perfect for paleo dieters and families looking for an easy source for grass-fed hormone-free meats! Check out our Butcher Box reviews to learn more! Example products: USDA certified organic, certified humane, 100% grass-fed lamb, 100% antibiotic and hormone free, pasture-fed beef, certified humane, antibiotic and hormone free pork, cage-free, free-range, certified humane, USDA certified organic chicken. The Cost: Ranges from $7.75 per cup for 9 per box, to $6.99 per cup for 24 per box. COUPON: Use code ADDICTION to get 3 free cups with a 9, 12, or 24-cup plan! What kind of food do you get? : Daily Harvest started as a smoothie brand, but they’ve expanded into lots of other superfood categories since: Smoothies, Harvest Bowls, soups, lattes, oat bowls, chia bowls, and even plant-based gluten-free cookies! They’re all designed to fill you up with healthy fruits and veggies with minimal prep work (most simply require adding liquid and heating or blending). Check out our Daily Harvest Reviews to learn more! The Cost: $4.99 per portion + $8.99 shipping. Sign up here! What kind of food do you get? : Dinnerly is all about simplicity. Their recipe cards are digital, so there’s less paper to keep track of, and their crowd-pleasing, affordable recipes tend to use fewer ingredients. That means less time between you and a yummy dinner for yourself or your family! Pick between 3-5 meals per week. Check out our Dinnerly reviews to learn more! Which special diets do they cater to? : Vegetarian, but not consistently. That wraps up our list of the Best Cooking and Meal Kit Subscription Boxes! Did your favorites make the list?